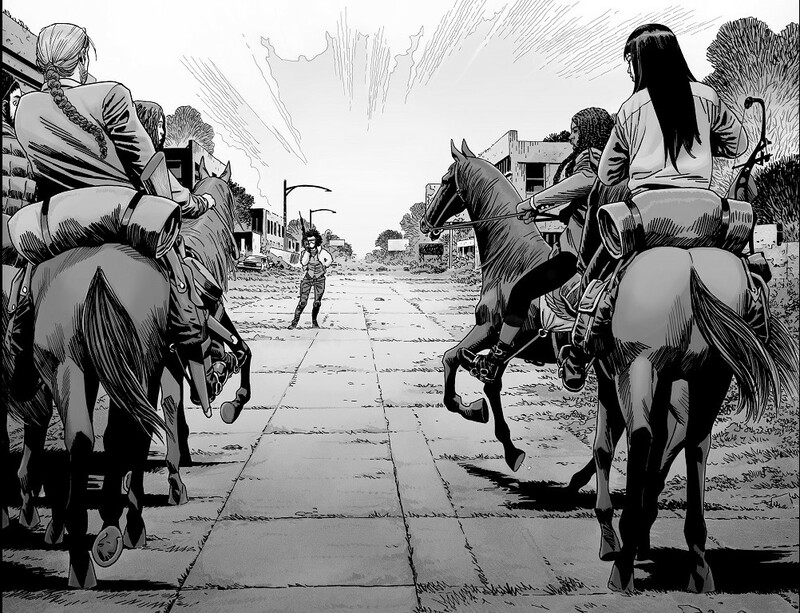 A Look at The Walking Dead #171: “Fear the Princess” | What Else is on Now? Haven’t had a new character in awhile. Let’s change that. This was an interesting read. We move quickly past the tension between Siddiq and Eugene and onward towards meeting a new character. I suppose you could call this the equivalent of a bottle episode in that we only spend time with the group on the road, which I like. Since they have a long ways to go, it makes sense that there would be long stretches of chapters with just this group traveling. And it helps that, right now, there’s really no need to return to Alexandria or any other community. It’s just on the road, and I’m fine with that. It’s a very quick read, this one. The cliffhanger from #170 is resolved in no time and the bulk of this issue is spent meeting and interacting with the new character. But we’ll get to her in a moment. But onto the conflict. Picking up from where we left off, Siddiq tells Eugene that Rosita planned to leave him. But the brief flashback, in which Rosita looks quite different from what we’re accustomed to, shows that no, she in fact was not going to leave Eugene. Quite the opposite. However, with Siddiq suffering from so much guilt and regret, Eugene can’t bring himself to tell Siddiq the truth. It may or may not come up later, but there’s no point in Eugene saying anything now. 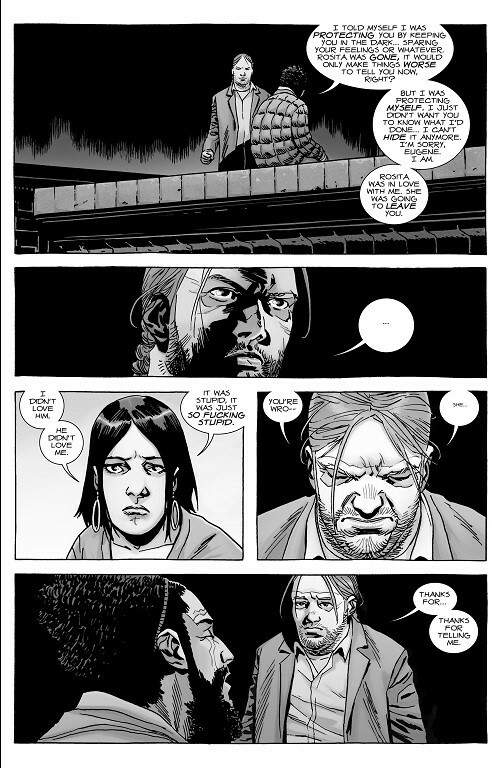 Siddiq already feels awful for what he’s done and even if Eugene came clean about Rosita’s true intentions, that would just drag out the problem. Better to just comfort Siddiq now and move on from there. 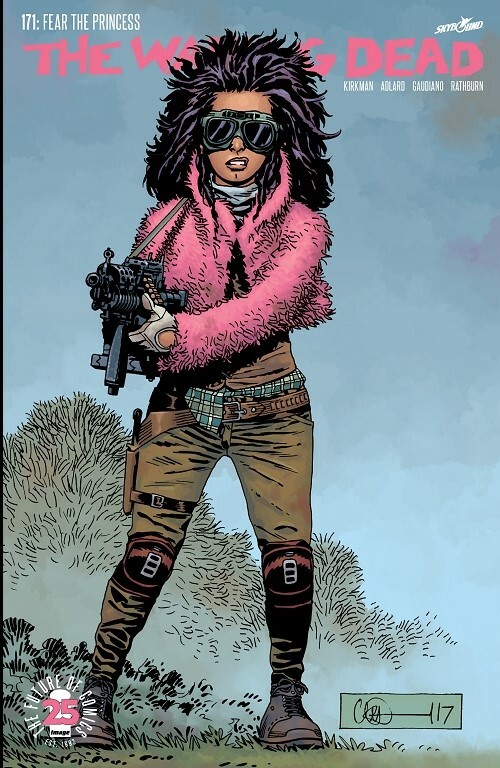 And it’s here that we’re introduced to the newest character in The Walking Dead: Juanita Sanchez. The self-proclaimed Princess of Pittsburgh. Juanita makes a strong first impression, in my opinion. She’s talkative and quite colorful. 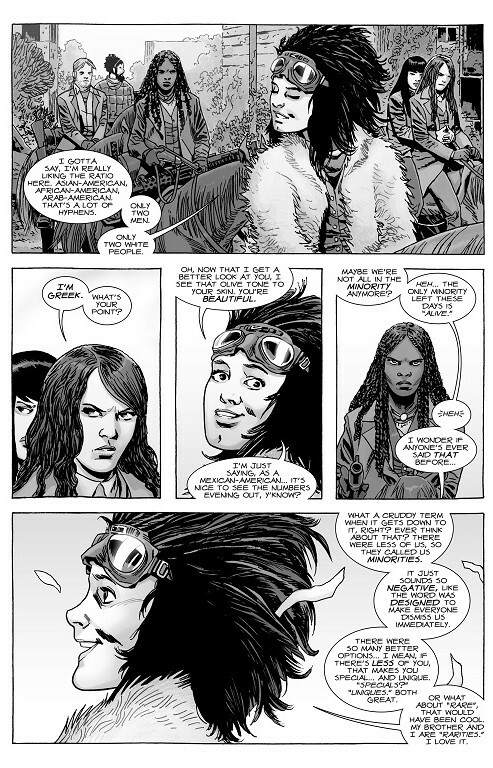 Well, going by the comic cover and how she describes her look, given that this is a black and white comic book. She reminds me a bit of Ed from Cowboy Bebop. Since Juanita talks so much, it goes without saying that we learn a great deal about her. She’s been alone for a year, but still knows her way around a weapon. But, in her words, she’s loopy from not having anyone to talk to for so long. At this point, I’m expecting her to pull a Last Man on Earth scenario where she paints faces on inanimate objects and talks to them. Maybe that’s coming down the line. 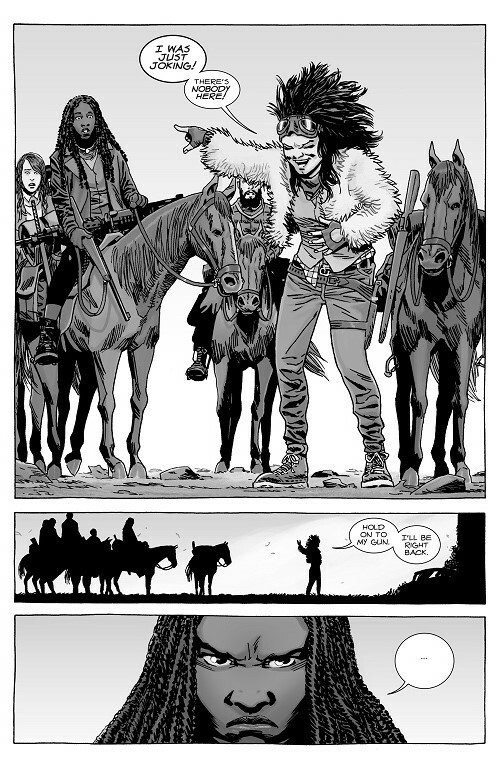 Like any other new character that’s been introduced, the survivors don’t just embrace her with open arms. 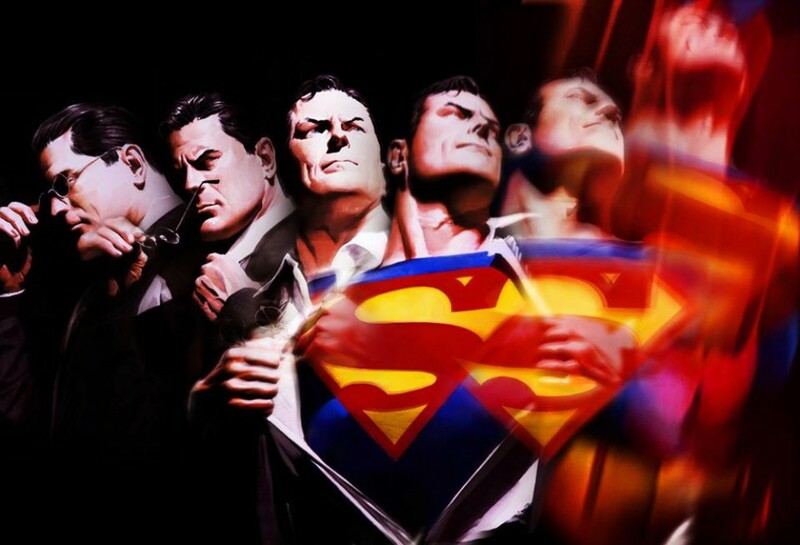 It’s an argument as old as time in this world: we don’t know you, so there’s no reason to trust you. 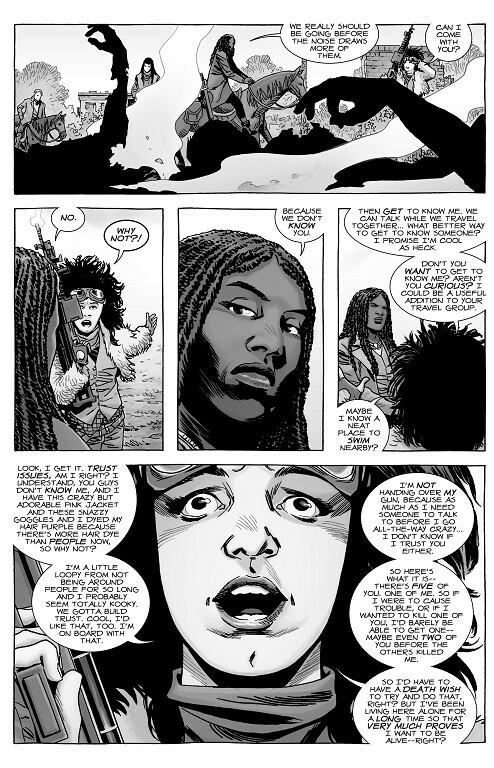 Granted, this argument works both ways and Juanita was right when she pointed out that she only ran into the survivors because of Michonne yelling out, but despite her good intentions, she’s still a stranger. That and she’s outnumbered, so at least she’s smart enough to point that if she tried anything risky or stupid, she’d be killed in no time. But she’s not willing to just roll over and concede to these strangers’ terms since she has just as much of a reason to be cautious. That I appreciate, as even though she’s outgunned, she acknowledges the risk she runs with this random run-in. I’m of two minds about some of her dialogue, though. Her calling attention to the racial diversity, liking the ratio, and saying how negative the term ‘minorities’ is compared to something like ‘rarities’ and ‘specials’ makes sense. And it does feel like something that someone would randomly point out in a diverse group, but odd that she chose this rather than talk about her upbringing or life before the outbreak. 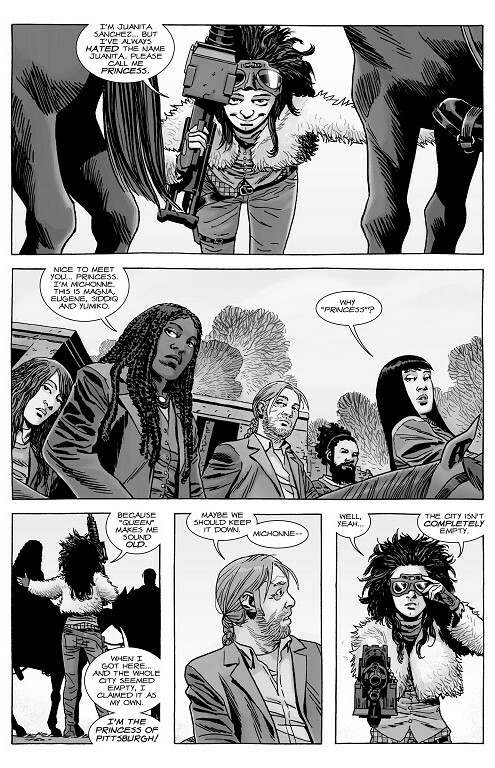 But, given the makeup of the group, it’s at least an area where Juanita can find common ground with the others, even if Michonne isn’t a fan of how much Juanita talks. I can agree, she does come off like a motormouth, but right now at least, she’s not getting on anyone’s nerves. It would be very easy to turn her into a Scrappy Doo for the sake of comic relief. Who knows? Maybe she is just a jokester. After all, she got everyone to freak out when she made it seem like she other people with her. Doubt that’s the case and I wager that if she is indeed just screwing around, this will give the others even less of a reason to trust her because they’ll believe she’s dishonest. Call me crazy, but I think she’s telling the truth and just messing around. In hindsight, I’m surprised at how fast this issue went by, but I still enjoyed it. The Princess of Pittsburgh made a solid first impression and she’s a real wild card compared to most of the cast. I look forward to seeing how well she’ll mix with the rest of the survivors. 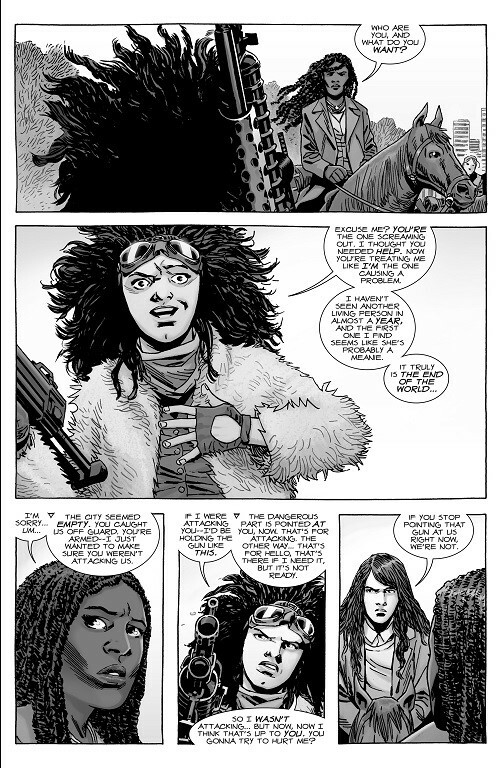 This entry was posted in The Walking Dead and tagged Eugene Porter, Juanita Sanchez, Magna, Michonne, Siddiq, The Walking Dead, Yumiko by omarid513. Bookmark the permalink.